December 1, 2011 — CHRISTMAS IS A TIME TO GIVE — AND ONTARIO BINGO HALLS ARE GIVING IT THEIR ALL FOR YOU! Playing Bingo is one of the best ways to show your support of your favourite charitable or not-for-profit groups in your community! Treat family and friends to a few games of chance and fun over the Holidays, or on any day, at just about any time you want!! See Ontario Charitable Gaming Centre advertisements for more December 2011 events and promotions — including New Year’s Eve Party Details!! TRY A BINGO EVENT THAT’S REALLY DIFFERENT: Ever wondered what it’s like to play Bingo under black light — when everything glows in the dark??? CLICK HERE and check out “Cosmic Bingo” at Uncle Sam’s Bingo in Fort Erie before the year ends! ALSO IN THIS MONTH’S EDITION: BINGO PLAYER “TREASURE QUEST” CONTEST #62. THREE PRIZE LEVELS FOR DECEMBER 2011: Win [$100.] CA$H, or [1 of 2] $50. Bingo Gift Certificates, or [1 of 3] $25. Bingo Gift Certificates. *** 6 PEOPLE WILL WIN PRIZES! SPECIAL $100,000.00 BINGO GAME — THIS IS YOUR LAST CHANCE TO WIN REALLY BIG!!! CLICK THE ICON ABOVE NOW, OR WHEN YOU SEE IT ON YOUR FAVOURITE HALL’S PAGE ON OUR WEBSITE! Final Game: Saturday, December 3, 2011 / during the 7pm Session! November 1, 2011 — FALL IN LOVE WITH THE GAME OF BINGO! Playing Bingo to win is everyone’s aim. It’s also one of the best and most interactive ways to show your support of your favourite charitable or not-for-profit groups in your community is by visiting one of Ontario’s Charitable Gaming Centres today! Treat family and friends to a few games of chance and fun any day, at just about any time you want!! See Hall advertisements for more November 2011 events and promotions — including Remembrance Day poppy drives!! SPECIAL RETIREMENT NEWS: Bingo Player wishes Delta Mississauga’s JEAN SIBLEY only the best in her retirement. CLICK HERE to see a special news story about the event, honouring Jean! 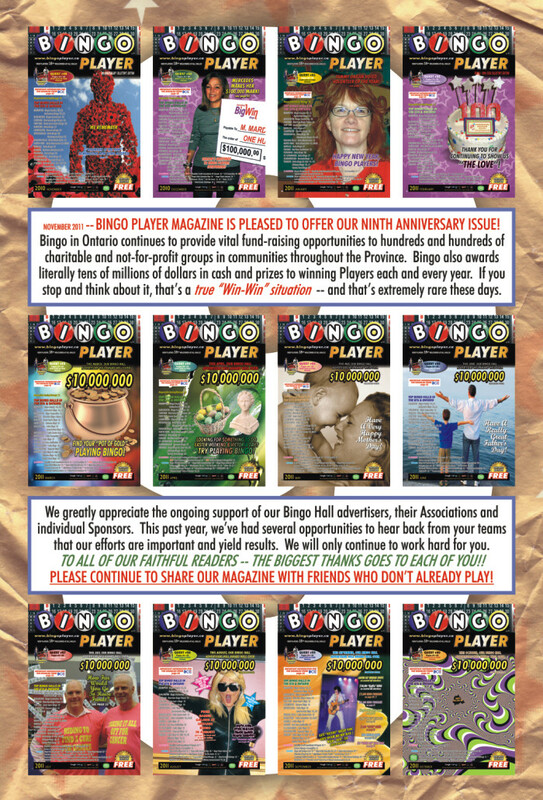 UPDATE #1: The printed issue of Bingo Player contained an error for Rutherford Bingo’s “All Or Nothing” event. It should read, “Win in 53 numbers, or less” — not in 51 numbers, or less. We regret the error and have posted updated calendar and text information! UPDATE #2: At the time of printing the NOV’11 issue, Delta St. Clair’s “Program Re-Invention Details” were still being confirmed. We have now posted the correct information! ALSO IN THIS MONTH’S EDITION: BINGO PLAYER “TREASURE QUEST” CONTEST #61. THREE PRIZE LEVELS FOR NOVEMBER 2011: Win [$100.] CA$H, or [1 of 2] $50. Bingo Gift Certificates, or [1 of 3] $25. Bingo Gift Certificates. *** 6 PEOPLE WILL WIN PRIZES! October 1, 2011 — WE’RE THANKFUL YOU PLAY BINGO! One of the best and most interactive ways to show your support of your favourite charitable or not-for-profit groups in your community is by visiting one of Ontario’s Charitable Gaming Centres today! See Hall advertisements for more October 2011 events and promotions — including Thanksgiving and Hallowe’en!! ALSO IN THIS MONTH’S EDITION: BINGO PLAYER “TREASURE QUEST” CONTEST #60. THREE PRIZE LEVELS FOR OCTOBER 2011: Win [$100.] CA$H, or [1 of 2] $50. Bingo Gift Certificates, or [1 of 3] $25. Bingo Gift Certificates. *** 6 PEOPLE WILL WIN PRIZES! 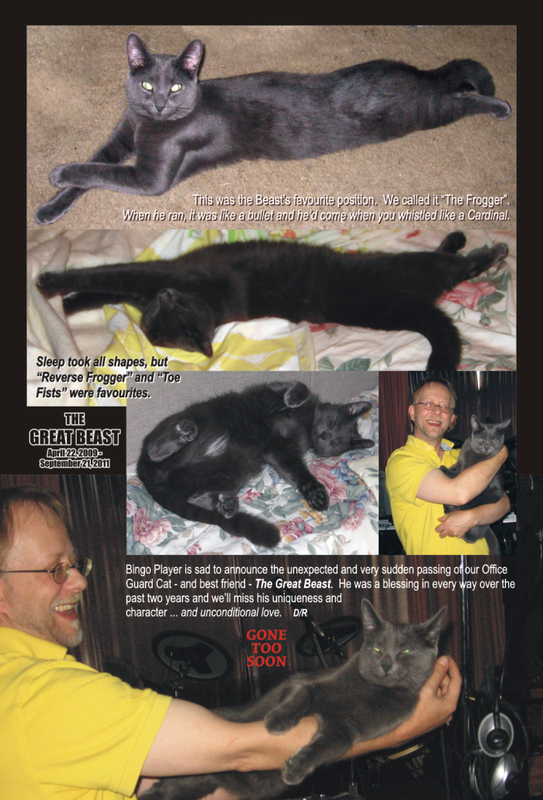 September 21, 2011 — 2:00am * Bingo Player Magazine is sad to announce the sudden and untimely passing of our office cat — THE GREAT BEAST. September 8, 2011 — THIS JUST IN …… Ultimate Bingo has just announced they are offering another $1 Verifiers opportunity every Sunday 7pm Session — that THREE $1 Verifier opportunities each week! September 1, 2011 — THIS JUST IN …… Ultimate Bingo has just announced they are offering a 15 x $1,000 Program every Friday & Saturday 7pm Session in September — that’s 50% more prizeboard opportunity on that session (used to be 10 x $1,000) through September! September 21, 2011 — IT’S TIME TO GET BACK TO YOUR REGULAR SCHEDULE! REMEMBER TO TRY BINGO THIS FALL! One of the best and most interactive ways to show your support of your favourite charitable or not-for-profit groups in your community is by visiting one of Ontario’s Charitable Gaming Centres today! Treat family and friends to a few games of chance and fun over the Labour Day Weekend!! See Hall advertisements for more September 2011 events and promotions!! ALSO IN THIS MONTH’S EDITION: BINGO PLAYER “TREASURE QUEST” CONTEST #59. THREE PRIZE LEVELS FOR SEPTEMBER 2011: Win [$100.] CA$H, or [1 of 2] $50. Bingo Gift Certificates, or [1 of 3] $25. Bingo Gift Certificates. *** 6 PEOPLE WILL WIN PRIZES! August 1, 2011 — BEAT THE SUMMERTIME BLUES (AND THE HEAT) BY PLAYING BINGO! Show your support of your favourite charitable or not-for-profit groups by visiting one of Ontario’s Charitable Gaming Centres today — and treat your friends to a few games of chance and fun!! See Hall advertisements for more August 2011 events and promotions!! ALSO IN THIS MONTH’S EDITION: BINGO PLAYER “TREASURE QUEST” CONTEST #58. THREE PRIZE LEVELS FOR AUGUST 2011: Win [$100.] CA$H, or [1 of 2] $50. Bingo Gift Certificates, or [1 of 3] $25. Bingo Gift Certificates. *** 6 PEOPLE WILL WIN PRIZES! July 1, 2011 — CELEBRATE YOUR COUNTRY ON JULY 1st! Show your pride for Canada by supporting some of your favourite charitable or not-for-profit group by visiting one of Ontario’s Charitable Gaming Centres today — and treat your friends to a few games of chance and fun!! See Hall advertisements for more July 2011 events and promotions!! ALSO IN THIS MONTH’S EDITION: BINGO PLAYER “TREASURE QUEST” CONTEST #57. THREE PRIZE LEVELS FOR JULY 2011: Win [$100.] CA$H, or [1 of 2] $50. Bingo Gift Certificates, or [1 of 3] Bingo Seat Cushions [retail value approx. $25], courtesy of G-E Consulting. *** 6 PEOPLE WILL WIN PRIZES! June 1, 2011 — CELEBRATE YOUR DAD IN JUNE! Show your support of your favourite charitable or not-for-profit group by visiting one of Ontario’s Charitable Gaming Centres today — and treat your Dad to a few games of chance and fun!! See Hall advertisements for more June 2011 events and promotions, including Victoria Day Weekend events and special information!! ALSO IN THIS MONTH’S EDITION: BINGO PLAYER “TREASURE QUEST” CONTEST #56. THREE PRIZE LEVELS FOR JUNE 2011: Win [$100.] CA$H, or [1 of 2] $50. Bingo Gift Certificates, or [1 of 3] Bingo Seat Cushions [retail value approx. $25], courtesy of G-E Consulting. *** 6 PEOPLE WILL WIN PRIZES! May 1, 2011 — CELEBRATE YOUR MOM IN MAY! Show your support of your favourite charitable or not-for-profit group by visiting one of Ontario’s Charitable Gaming Centres today — and treat your Mom to a few games of chance and fun!! See Hall advertisements for more May 2011 events and promotions, including Victoria Day Weekend events and special information!! ALSO IN THIS MONTH’S EDITION: BINGO PLAYER “TREASURE QUEST” CONTEST #55. THREE PRIZE LEVELS FOR MAY 2011: Win [$100.] CA$H, or [1 of 2] $50. Bingo Gift Certificates, or [1 of 3] Bingo Seat Cushions [retail value approx. $25], courtesy of G-E Consulting. *** 6 PEOPLE WILL WIN PRIZES! April 1, 2011 — SPRING INTO YOUR LOCAL BINGO THIS APRIL! Show your support of your favourite charitable or not-for-profit group by visiting one of Ontario’s Charitable Gaming Centres today!! See Hall advertisements for more April 2011 events and promotions, including Easter Weekend events and special information!! ALSO IN THIS MONTH’S EDITION: BINGO PLAYER “TREASURE QUEST” CONTEST #54. THREE PRIZE LEVELS FOR APRIL 2011: Win [$100.] CA$H, or [1 of 2] $50. Bingo Gift Certificates, or [1 of 3] Bingo Seat Cushions [retail value approx. $25], courtesy of G-E Consulting. *** 6 PEOPLE WILL WIN PRIZES! March 1, 2011 — IT’S A GOOD TIME TO TEST YOUR “LUCK” PLAYING BINGO IN ONTARIO! Show your support of your favourite charitable or not-for-profit group by visiting one of Ontario’s Charitable Gaming Centres today!! See Hall advertisements for more March 2011 events and promotions, including St. Patrick’s Day events and special information!! CLICK HERE for information from a new advertiser, NOTHERS SIGNS & RECOGNITION. Great items for all kinds of sports teams, corporate and school awards, and much more. Great ideas for your Bingo V.I.P. Programs, too! Nothers recently created a unique award and program for the Canadian Baseball Hall Of Fame. Let Nothers create something great for your Big Winners, too! CLICK HERE for Epilepsy’s “Purple Day” campaign information! ALSO IN THIS MONTH’S EDITION: BINGO PLAYER “TREASURE QUEST” CONTEST #53. THREE PRIZE LEVELS FOR MARCH 2011: Win [$100.] CA$H, or [1 of 2] $50. Bingo Gift Certificates, or [1 of 3] Bingo Seat Cushions [retail value approx. $25], courtesy of G-E Consulting. *** 6 PEOPLE WILL WIN PRIZES! February 1, 2011 — IT’S A GOOD TIME TO FIND OUT HOW MUCH YOU MIGHT LOVE BINGO! Show your support of your favourite charitable or not-for-profit group by visiting one of Ontario’s Charitable Gaming Centres today!! See Hall advertisements for more February 2011 events and promotions, including Valentine’s Day events and special information!! CLICK HERE FOR A SPECIAL MEMORIAL PAGE HONOURING DEAN POTTLE (DELTA MISSISSAUGA) WHO PASSED SUDDENLY IN LATE DECEMBER 2010. YOU MAY ALSO FIND THE SPECIAL MEMORIAL ISSUE (FEB’11) OF THE “DELTA NEWS”, HONOURING ITS FOUNDER AND FRIEND – DEAN POTTLE. ALSO IN THIS MONTH’S EDITION: BINGO PLAYER “TREASURE QUEST” CONTEST #52. THREE PRIZE LEVELS FOR FEBRUARY 2011: Win [$100.] CA$H, or [1 of 2] $50. Bingo Gift Certificates, or [1 of 3] Bingo Toastie Comforters [retail value approx. $25], courtesy of G-E Consulting. *** 6 PEOPLE WILL WIN PRIZES! January 1, 2011 — IT’S A NEW YEAR! MAKE PLAYING BINGO YOUR NEW YEAR’S RESOLUTION! profit group by visiting one of Ontario’s Charitable Gaming Centres today!! See Hall advertisements for more January 2011 events and promotions, including Seasonal Hours and New Year’s Eve Party information!! ALSO IN THIS MONTH’S EDITION: BINGO PLAYER “TREASURE QUEST” CONTEST #51. THREE PRIZE LEVELS FOR JANUARY 2011: Win [$100.] CA$H, or [1 of 2] $50. Bingo Gift Certificates, or [1 of 3] Bingo Toastie Comforters [retail value approx. $25], courtesy of G-E Consulting. *** 6 PEOPLE WILL WIN PRIZES!